If you sell auto parts or/and moto parts, this is a #1 addon to install. Make, Model, Year and Engine filters guarantee that your buyers find the right parts for their vehicle. The filters show up on all pages in your online store. A customer selects a make of car (vehicle brand), a model, a year and an engine using convenient modern selectors and gets a list of parts for the vehicle with set characteristics. Registered customers can save their vehicles in the account. Next time they come to your store, they will see the parts for their vehicles right away without the need to use filters. You should add values for the filters according to the brands and models the store is going to sell. 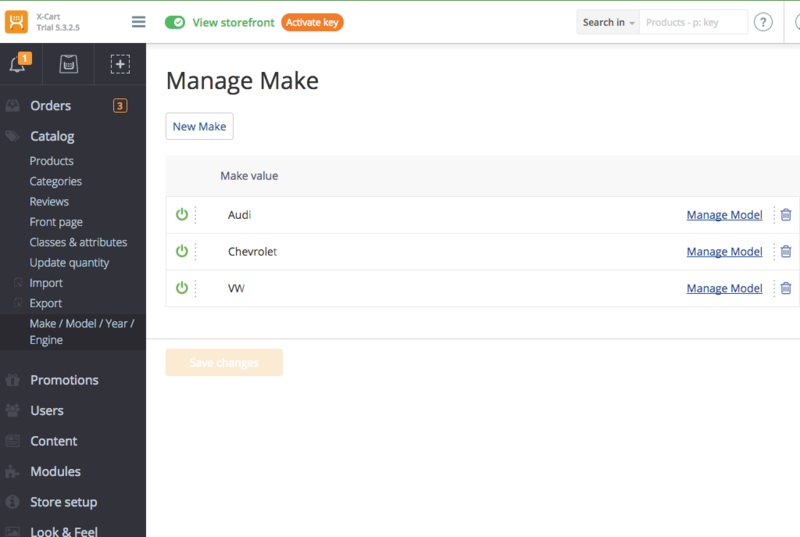 First, add values to the first level – Make (Audi, BMW, Porsche, Subaru, etc). Then add Models for each Make (like A5, Q3, and RS for Audi; X5, M3 Sedan and i8 Coupé for BMW; Cayenne S, Macan GTS and Panamera Turbo Sport Turismo for Porsche, etc) After this, add Years for each Model. You can complete the configuration on this step or go further and add Engine values for each Year. When you add all the values for each level, you can assign products to the last level of the filters, i.e. Year or Engine. That’s it! You’re all set and now your buyers can easily find what they need and place the order right away. You can define the number of filter levels. You can keep only 2 filters (Make and Model) or 3 filters (Make, Model and Year) or use all 4 (Make, Model, Year and Engine). Besides you can rename the filters and have, for example, Year as a primary level filter or you can give it any other name depending on your business needs. The addon remembers the filter settings for non-logged in visitors. So, next time they come to your store, they can start browsing auto parts right away with no need to specify their vehicle first. This feature ensures convenient and quick shopping for your returning customers who have several vehicles. 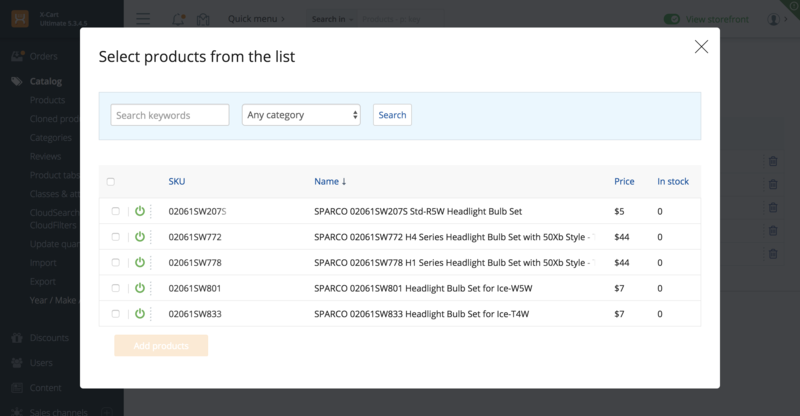 Your buyers can save multiple filter sets with “Remember my vehicle” option in their account and just select the vehicle for which they need the spare parts. The store administrator can view the filtering statistics which are very useful when deciding upon adding new products to the catalog or starting promotions. Add filter values (Makes, Models, Years and Engines) in bulk using a CSV import tool. 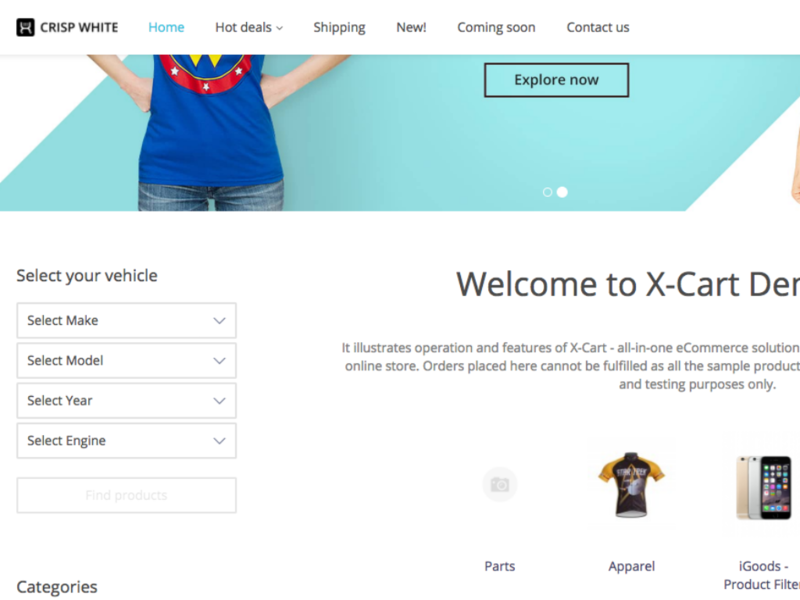 It will also help to quickly assign vehicles to the products in your store. When the addon is enabled a new checkbox for Make/Model/Year feature appears in the Export tool page. When you configure the addon (set the number and the names of filter levels), just request the Make/Model/Year CSV export to get the correct format of the file for importing the filters’ data to your store. To assign vehicles to your products, use the existing Import/Export tool for products. The addon allows configuring landing pages which will show up depending on the selected filters. It’s especially useful if you want to provide your customers with additional information on Make, Model or particular vehicle when they select it. Due to flexible settings, you can set the same page, for example, for all BMW models and years or a separate page for each BMW model (and even year). Using a simple interface you can set the page Title, Image and Description. 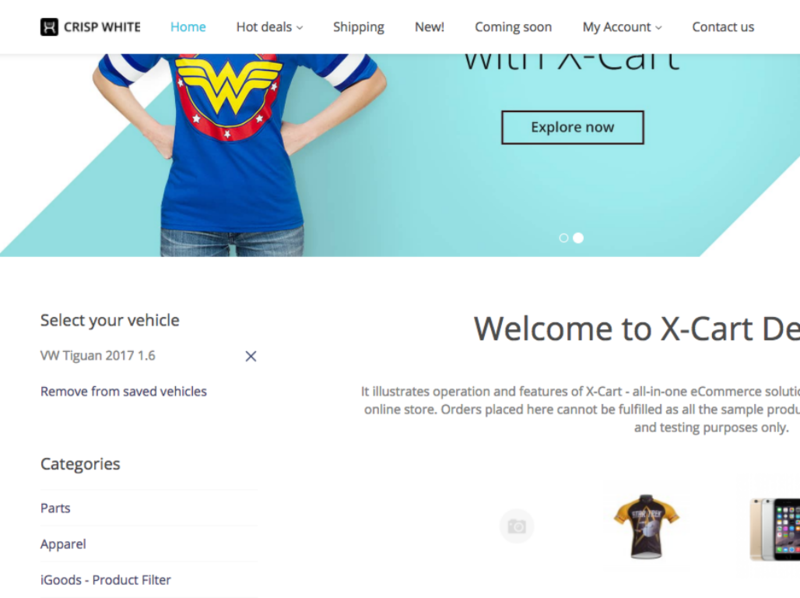 When a customer clicks to filter the parts, he will be redirected to the corresponding landing page with its own name, image and information. This page will also contain the list of spare parts for the vehicle specified by the customer. 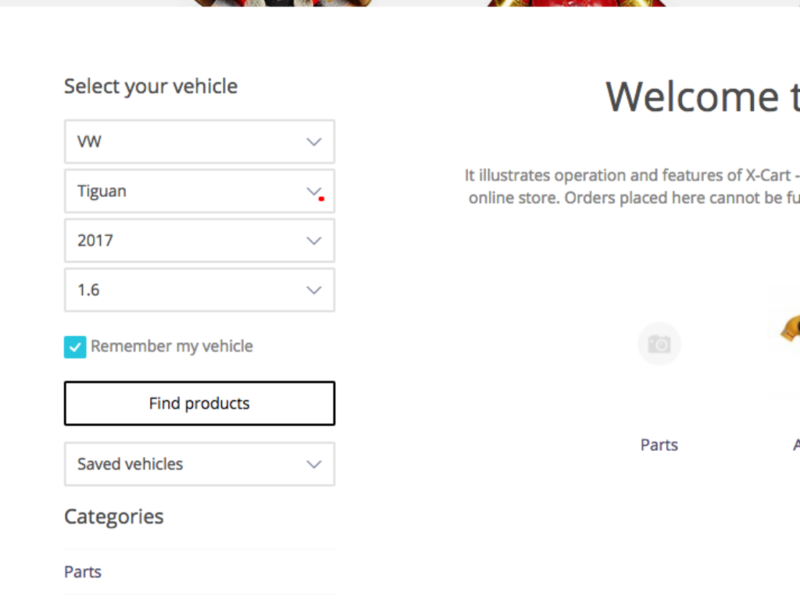 If a product is assigned to any vehicle, there appears an additional tab Fitment on the product page in the storefront. It includes information on all the vehicles the part can be used for. You can set the fitment table to show up in a separate tab or in the Description tab. A good module for sellers in the automotive aftermarket, very easy to assign products to vehicles and import product > vehicle data. Does however require more control over which categories and or products use the module but I have been told this is something the development team are working on.